A story of museum musings that began on a winter day in New York in 2010 reached its conclusion on a winter day in Florida in 2019, when the Norton Museum of Art reopened to the public. You might have expected it to go wrong—and yet this expansion has gone surprisingly right. How it went right is a triumph for South Florida. It should serve as a lesson for museum planners everywhere. If today’s museums must grow, grow they must. The Norton checks all the boxes of a museum’s new-car mandates (new restaurant, new lounge, new shiny surfaces), yet it stays remarkably sensitive to art and to the history of the institution that has held the art in trust. On approaching the Norton’s new entrance from the South Dixie Highway, as most everyone in car-centric West Palm now must do, the first growth you notice is not the museum but a tree. This is not just any tree. It is the tree. Known as “the banyan,” but in fact a ficus altissima, the six-story-tall tree is the focal point of the new west-wing façade. Photographs do not do justice to its outsize presence. Foster calls the tree his “protagonist.” Indeed, it drives much of the plot of the new design. Forty-three feet up, elevated on cloud-white blocks, an aluminum canopy extends forty-five feet over a new entrance plaza. The canopy is a sharp horizontal, made of reflective panels like an airplane wing. From afar, the form seems to cut across the middle of the sixty-five foot tree, a slashing antagonist in an architectural drama. Yet the protagonist wins out. The canopy pulls back at just the right places so that the hundred-twenty-foot-wide tree can continue to grow and spread above the new roofline. Up close, outside the new museum entrance, the sculptural qualities of this massive tree are striking. The banyan is its own work of art, a dizzying abstraction above, a gothic mystery below, with multiple trunks that have grown out of the many “prop roots” sent down over decades by its own bending limbs. And rather than compete with the tree, up close the aluminum roofline works with it to extend the shade of the natural canopy, adding welcome relief from the Florida sun. The banyan tree along the South Dixie Highway entrance to the Norton Museum of Art. Photo: Nigel Young. The symbolism of this thriving tree is well appreciated by Foster. His architectural deference to its living history reveals something about his own approach to imposing new designs on living institutions—as he did successfully with Hearst Tower, which rises out of a 1928 base, and most famously with his additions to the Reichstag and the Great Court of the British Museum, completed in 1999 and 2000. “The protagonist of the project was planted just before Ralph and Elizabeth Norton planted their seed,” he said at the museum reopening. The flourishing tree represents a flourishing institution in its increasing complexities. Rather than cut it down, the new design frames its growth for us to see. It protects rather than rejects history. It allows an organism to thrive through deep roots and existing branches. The challenge now of caring for the banyan reflects the challenge of caring for the museum. Since the tree’s failure would cause Foster’s design to fail, they are both closely interconnected. This is a fact not lost on the museum’s attentive arborists. The plaza cleverly features another large sculptural form: Typewriter Eraser, Scale X(1999), by Claes Oldenburg and Coosje van Bruggen. This 2017 donation to the museum by one of its trustees, Ronnie Heyman, was sought out by Foster, and with good reason. With its upturned brush resembling the branches of a tree, the Oldenburg serves as a symbolic pendant to the banyan. While allowing for growth, Foster has had to do some judicious editing of the Norton’s existing structures. The Eraser happens to touch down next to a part of the building that had been one of those loquacious later additions. Edited down, while still providing upstairs gallery space, this wing now fits into Foster’s concise five-paragraph essay of architectural form. 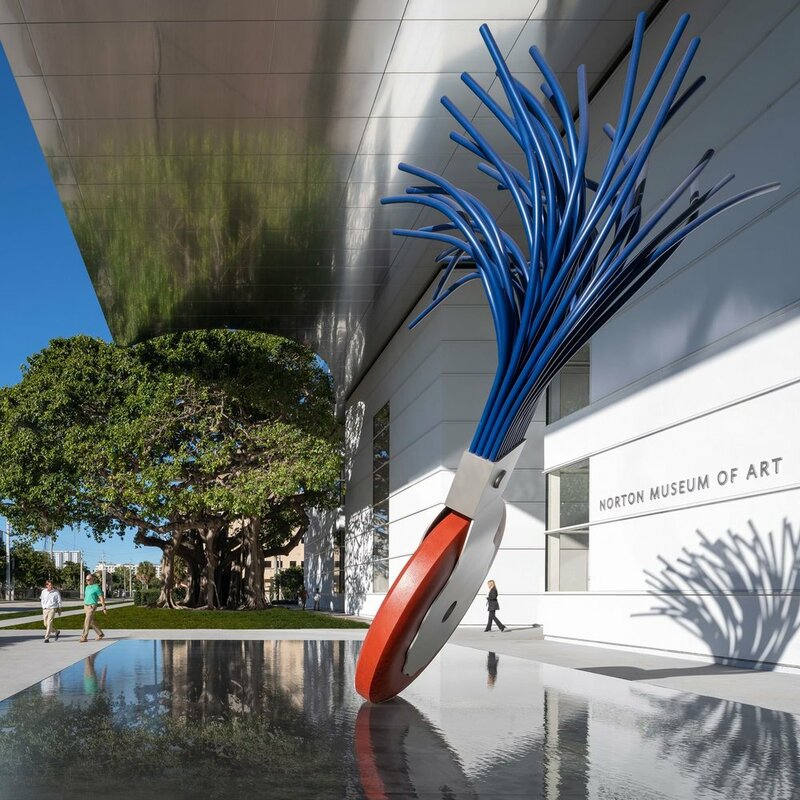 Typewriter Eraser, Scale X(1999) by Claes Oldenburg and Coosje van Bruggen (foreground) and the banyan tree in front of the Norton Museum of Art. Photo: Nigel Young. A convincing seamlessness of old and new, living and man-made, has been achieved through an uncanny awareness of existing ties and a balance of existing structures. “It started with two people, Ralph and Elizabeth Norton, in 1941,” Foster said of the museum. All such projects should begin with an appreciation of an institution’s founders. Too few do. Here such respect for the couple who bequeathed their collection to the public trust, with its particular strengths in American and European modern painting and drawing, as well as Chinese art, ultimately informs the overall design. Re-established as the center of the institution is the Norton’s original 1941 museum building, which, like the banyan, determines the shape and placement of the new entrance. Designed by Marion Sims Wyeth as an Art Deco pavilion surrounding a central courtyard, the building’s original symmetry and sight lines have been restored by cutting back the infelicitous additions from 1997 and 2003. As Foster creates his new façade facing the banyan tree to the west, he preserves the original front façade to the east. He also restores the ground floor’s east–west axis after it was disrupted by the earlier expansions that turned the museum entrance to the south. Now someone standing outside the new building can see all the way through to the old front door and on to the shimmering Intracoastal Waterway beyond. I only wish the acoustics of this new entry plaza were as appealing as its form. On the day I visited, the noise of the South Dixie Highway, combined with the screech of a nearby rail line, was deafening. It might be said that every contemporary building “learned from Las Vegas.” A structure must now not only shelter the individual on foot, but also flag down the passing motorist on the road—functions that are often in conflict. But what happens in Vegas should stay in Vegas. While Foster’s aluminum canopy protects the entrance from the sun, it also acts like a bandshell to concentrate street noise on the exposed plaza. While it might take away from the museum’s billboard qualities, additional screening between the highway and museum is in order. Perhaps already understanding the need of an added buffer between outside and in, Foster brings the visitor into the new wing slightly off axis. A quick turn to the left after the ticket booth then brings you into a new Great Hall (as it is called) and back into alignment with the original museum. Every great building needs a “great hall”—a place to decompress from the outside and adjust to the expectations within. The Norton has dubbed this space its “living room.” In its tasteful modernist furniture and bleached tones, it might just double as a Knoll showroom. It is indeed a pleasant enough room to linger, if not to live in. The Norton Museum of Art’s Great Hall. Photo: Foster + Partners. At the same time, with its maximum square footage designed for maximum flexibility, the hall lacks intimacy. All that tasteful furniture is easily moveable so that this Great Hall can serve as a flex space for great donor cultivation. A white box with gray accents (someone said that Foster designs in “fifty shades of gray”), the Great Hall is also topped with an oculus that looks squinty. Round skylights call for round rooms, not rectilinear ones. I wish Foster had rolled the dice and gambled on an interior that was more daring than another white cube—one that might also reflect the octagonal shape of the original eastern entrance. At least by adding this large new space, and fulfilling the museum’s new-car mandate, Foster could then restore and renew the many smaller adjoining galleries from the 1941 building. Of the museum’s 130,000 square feet, it is interesting to note that only about 10,000 of that are truly new. The preservation of older spaces allows for substantial “recycling,” as Foster says. The original 1941 hardwood floor, for example, has been brought back to life after being covered in decades of carpeting. The Art Deco entry also looks wonderfully preserved—although I wish outdoor access to the east were also restored so we could easily see the Norton’s two outdoor commissions by Paul Manship, which flank the original front door. The preservation of historical space preserves “the memory of time,” Foster says. This is also how a museum overhauled by a world-famous architect can still come in at $100 million, while the price tag for a new wing at the Metropolitan Museum is slated to cost upwards of $600 million. The best spaces here are the ones that have been brought back to life from the original building, where gallery proportions and arrangements were designed to best complement the art on view. I was very glad to see highlights of the Nortons’ bequests of European art arrayed front and center in one of these galleries. Here Monet’s Gardens of the Villa Moreno, Bordighera (1884) and De Chirico’s Sailors’ Barracks (1914) are presented with works by Klee, Soutine, Picasso, Braque, and Brancusi—all donated by the Nortons—and supplemented with bequests by later donors. Other galleries display the Nortons’ gifts of paintings and drawings by the Ashcan painters and first-generation American modernists such as John Marin and Maurice Prendergast, along with Stuart Davis’s 1932 painting New York Mural, purchased through an acquisition fund established by Ralph Norton. Taken together with the museum’s significant holdings in photography and Chinese art, you start to see that the Norton is not just a museum of art but a museum of significant art with an important core collection. Foster’s elegant and symbolic renovation brings that fact to the fore by allowing the museum to defer to this great art history. There are already some signs, unfortunately, that the new museum may try to upstage its impressive historical collection with contemporary work. An ability to attract new donors and bigger crowds is the constant seduction of the contemporary Kunsthalle. The Norton could do better than its dopey wall-decal commissions by Pae White and Rob Wynne, for example, or Instagram-optimized art such as the promised gift of Sam Durant’s End White Supremacy (2008), which is better suited for woke selfies at Art Basel Miami Beach. It is indeed a great art museum, if you can keep it.. 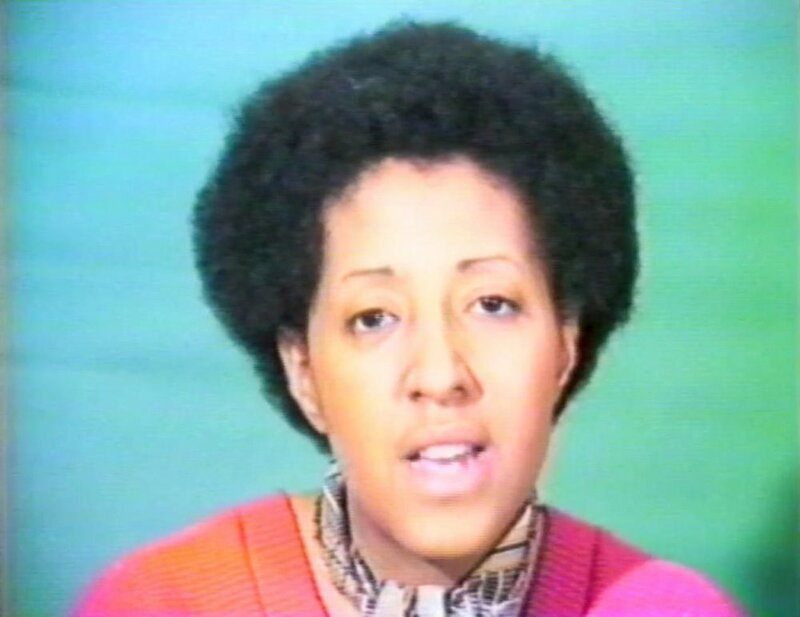 The art of Howardena Pindell comes back around to the circle. 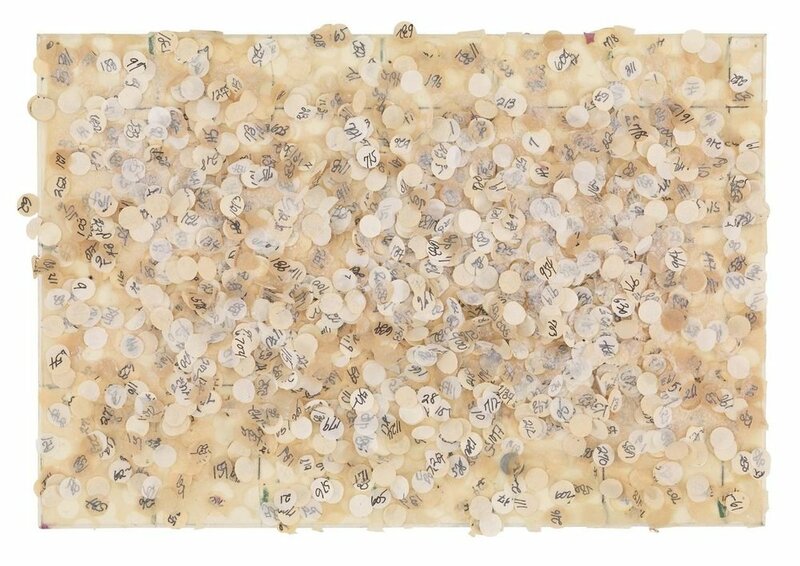 In “What Remains to Be Seen,” her 100-work retrospective now on view at the Virginia Museum of Fine Arts, there are brushed circles, sprayed circles, and circles punched out of paper. There are paper disks, thousands of them numbered by hand, and the holes from which they were cut. 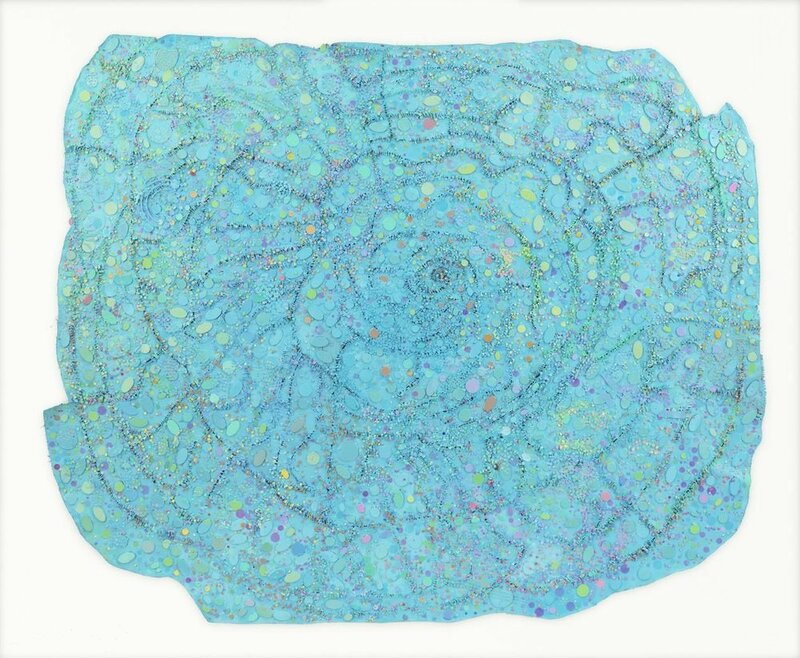 And there are depictions of stars and planets—in her 40s, Ms. Pindell took up the study of astronomy: Orbs of color and light cluster together in dense, spiraling constellations of collage. With her wide-ranging style and broad use of materials, Ms. Pindell has long been a round peg in a square hole. Enigmatic at times, didactic at others, she is an innovative abstractionist who also works in photography and video. In 1979, Ms. Pindell’s art pivots around two events: her departure from MoMA for a professorship at Stony Brook University, where she continues to teach today, and a serious car crash that affected her memory and sight. Politics, once sublimated in her abstractions, bubbles up to the surface. Words and images appear in her compositions with increasing stridency. Her canvases, now left unstretched, are cut up and stitched back together. While the first section of this exhibition displays Ms. Pindell’s range on canvas, the second shows her diversity of media. Here, works on paper are encrusted in shimmering material. Watercolor, gouache, crayon, ink, punched papers, spray adhesive, and thread may appear in a single composition. Collages made out of postcards from her many travels are cut into mesmerizing designs. Meanwhile, a suite of video work demonstrates the range of her art. In the mid-1970s, and again in 1988, Ms. Pindell took photographs of her television set, which she appended with cryptic notations on sheets of acetate adhered through static to the screen. “Free, White and 21,” a harrowing 12-minute video performance piece of 1980, speaks to her work’s confessional turn, as her biography became her subject matter. “Things cycle back around in Pindell’s work,” note the co-curators of this exhibition. While it may have complicated her career, her art’s nonlinear progression speaks to her aesthetic independence and suits the divided arrangement of this show. I could have used a trail of chads to connect the two sections, but a walk through the VMFA’s encyclopedic collection hints at the many sources of Ms. Pindell’s elliptical art, from Washington Color School painting to African textiles. As her latest works at one end of the museum—swirling abstractions such as “4C the Planets” (2007) and “Night Flight” (2015-16)—recall her earliest paintings at the other, we see her art come full circle.